PCCCS208 and a Sneak Peek! Hello, and welcome to another challenge with the Paper Craft Crew Design Team! I hope you’re ready for another fun sketch challenge – I see that you all had fun with last week’s challenge. Is that little bear adorable, or what??!! He is from a new set, available Sept. 1st, called Cookie Cutter Christmas. It’s an adorable 17 piece photopolymer set, and it has a coordinating punch – and of course, you can Bundle the stamp set & punch, and save 10%! The other images in the stamp set include a Santa, an Eskimo, a Gingerbread Man and a Reindeer, along with the bear, above. I stamped the bear image in Crumb Cake ink onto a scrap piece of Whisper White cardstock, then inked up the eyes/nose/mouth in Chocolate Chip ink, and stamped them on top. I used the coordinating Cookie Cutter Builder Punch, and punched out my bear; on my rectangle panel of Whisper White, I marked where I wanted my bear to be, then stamped the ears image in Chocolate Chip ink, then attached the bear using Stampin’ Dimensionals. I stamped the bow tie in Versamark ink on the scrap Whisper White, then used the New Glitter Stampin’ Emboss Powder (it comes in Real Red and Emerald Envy), and set it using my Heat Tool. You’re going to love this new glitter embossing powder – it’s glitter that won’t rub off! 🙂 The bow tie was attached with a Stampin’ Dimensional, then set aside. I took my 4″ x 5 1/4″ Whisper White panel, and used the Work of Art stamp set and the largest brush stroke image and stamped repeatedly in Crumb Cake ink. I then used the smallest dots image, and added dots in Real Red ink. 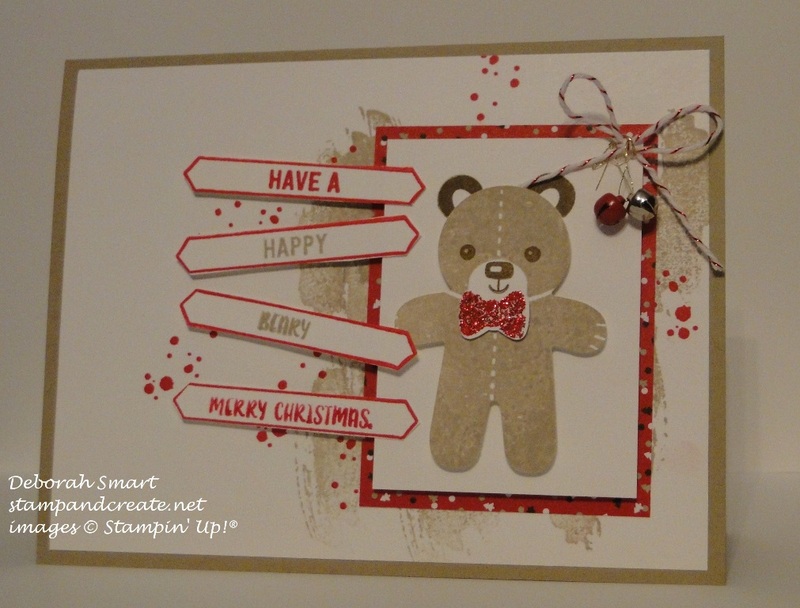 I added a panel of the new Candy Cane Lane Designer Series Paper to the right side, as per the sketch, then attached my stamped bear image panel on top of that, using Dimensionals. For the sentiments, I used a combination of words from the Cookie Cutter Christmas set, and the Thoughtful Banners set, stamped in a combination of Real Red and Crumb Cake. The banner outlines were stamped in Real Red, then hand cut using my Paper Snips. Going with the sketch, I placed them using more Dimensionals to the left side of the bear image. The final touch was to tie a bow using the new Candy Cane Lane Baker’s Twine (you get the Whisper White with Red Metallic thread that I used, plus a spool of solid Real Red for only $8!). I couldn’t resist adding one Red and one Silver of the new Mini Jingle Bells (30 of each colour to a package, for only $6!!). Trust me when I say that you are going to LOVE the new Holiday Catalogue! It is 55 pages of amazing, scrumptious, stamp sets, embellishments, Designer Series Paper, Dies, and more! So that’s my card for this PCCCS208 challenge – you’re going to want to click over to the Paper Craft Crew challenge page, to see what the rest of the Design Team has created (you won’t be sorry!). Be sure to link up your card for the challenge – you just may be our next Top Pick! This is such a cute card, Deborah! I love how you did the sentiments!